In her Filter Object Series, Ioanna Natsikou explores the relationship between object and subject, issues of selfhood and how identity can be perceived, experienced and performed through the medium of photography. She is interested in issues of femininity, sexuality, image and representation. Her work process relies on a playful and suggestive way, allowing the viewer a broader exploration. Drawing a thin line between the familiar and the unfamiliar, the work questions our stereotypical perceptions of female representation. In a deliberate process, tactility, visual puns, light and color are combined carefully to trigger a sense of fantasy and ambiguity. These portraits are conceived as ephemeral constructions of identities based on the coexistence of an object with the female body. Although the subject in the photographs is the artist’s body, Natsikou does not consider them as self portraits, merely using her body as “aesthetic material.” The fragmented photographic treatments of the female form, without definitive context, as well as the reconfiguration and displacement of found and assembled objects are part of a personal visual vocabulary suggesting innuendoes about beauty, sexuality, femininity, meanings of pleasure. The images represent mutable and performed identities; in flux, layered, not clearly evident, constantly changing: An assemblage of objects and selves that are perpetually fragmented. The photographs question identity, personality and performance, and demonstrate how they are inextricably intertwined in a multilayered relationship. Objects, roles and clichés are combined to surprise the viewer, creating new self images all the time. Moran Sanderovich’s sculptures depict transgressive bodies, venturing beyond the limits of biology into a fantastic realm that can reflect violence, empowerment, and potentiality. In elaborate performances and staged photo events, enacted in partnership with several photographers, Sanderovich creates cinematic situations wearing her prosthetic creations. Sanderovich turns the grotesque into poetic works that stems directly from bodily experience, also painful ones. She “finds power and strength from the depths of open wounds,” regarding it as part of female and queer experience alike. She notes that this power to create an alternative reality, to create an alternative body out of victimization, seems to be irritating to many, especially men. Employing sculpture, performance, video and drawing, Sanderovich speculatively extends the body’s organic boundaries. 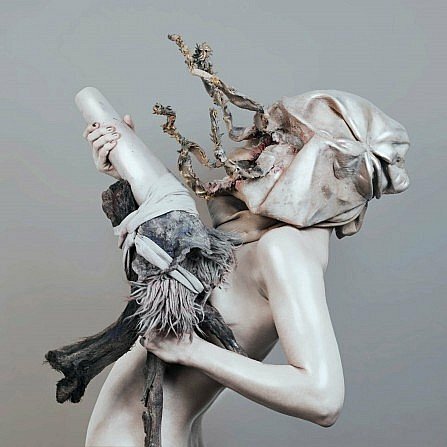 Embodying alternative human forms, she engages the grotesque and uncanny to produce visceral narratives of self-determination, transformation and possibility. Her work challenges and confuses normative conceptions of bodily limitation, taking disability, mutation, and decay as starting points for other forms of life. Many of the sculptures are made to be performed, acting as prosthetics that transform her body through extension or truncation. Her performances render illegible any perceptible distinction between her body and the sculpture, or the human and non-human. Moran uses her movement to elaborate on the inner characters of the objects she makes, conjuring up a parallel universe in which her unreal chimera live their lives and tell us their stories. In their mythological worlds, they depict tales of conflict, survival, transformation, genetic manipulation and transcendence. 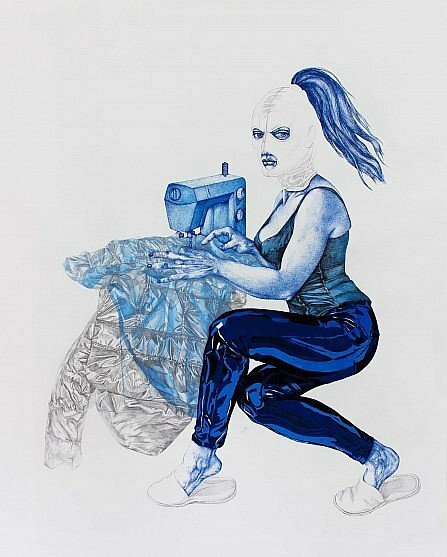 Ileana Pascalau depicts female figures between superheroic empowerment and the mundane. Between repression and libertinage, between collective fears and individual fantasies, Pascalau’s installations, sculptures and meticulously rendered drawings express a multi-layered image of the body. Her work creates analogies between past and the present, showing a Jungian connection and continuum between age-old art historical motifs and contemporary memes encountered in our daily life and visual culture. Her large-scale drawing series Exquisite Bodies explore contemporary female rituals of enjoyment, in which gestures animated by obscenity are captured like in a baroque tableau vivant, relating to the pictorial tradition of the Greek “Bacchanalia,” in which ecstatic rituals performed by women played a decisive role. Alcohol abuse, lascivity and all forms of collective hysteria were experienced by women as a manifestation of a deeper vitality. In her oil painting, Luiza Schiavo uses small strokes achieving a finely textured surface. 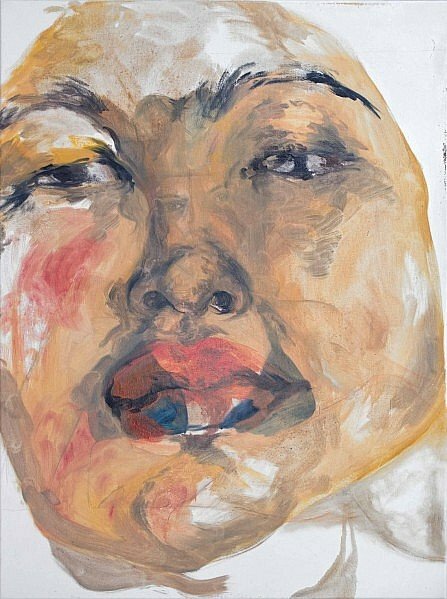 Her themes are often self portraits or biographical, questioning our relationships with the body, sexuality and identity. Painterly surface and psychological depth are united in direct and unflinching self observations. As intimate explorations of identity and persona, the moments Schiavo depicts are not necessarily the most beautiful or picturesque. 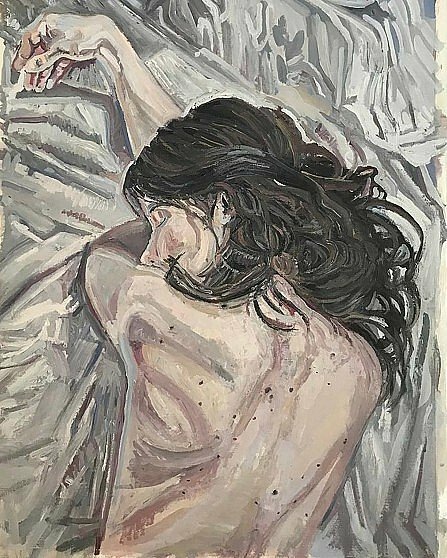 Instead they tell a deeper, richer story of the whole range of emotions because she is not afraid to depict her subjects at their most vulnerable. When her gaze becomes introspective she applies this same level of subversive sensitivity to her own figure. The result is a raw and uncompromising look at an extremely poignant and transitional period of her own life. As she states, painting allows Schiavo to express her subjective perception of reality. Each stroke of her brush adds texture to the surface of the canvas, mimicking the unevenness inherent in our own self-representation. It is from this unadulterated honesty that her portraits gain power to communicate their emotional depth.